Feel Free to use our website design and development steps checklist infographic, if you would like that one customized we can help or (even better) we would love the opportunity to work with you and develop you custom engagement materials. Define your brand's target audience and create buyer personas. Each buyer persona is a fictional representation of your typical customer. Define the solutions you provide and how it helps solve specific problems they have or how they can benefit from your products and services. Define how you will deliver your products and services to them. Decide what type of pages you will need in order to present your products, services, special offers, subscriptions, etc. Will you need a database? Will it need to be customized? Decide if you want to add special landing pages for your email, social and PPC campaigns. Decide if you will add a blog so you can use content marketing to bring in more traffic. Decide if there will be other things you want to add; live chat, forums, etc. Choose a website development platform that is best for delivering the type of products, services, and content you will be providing. Create an easy way to navigate to to other related pages from every page in your website. Decide how you want customers to contact you and make sure that’s easy to do. Create interesting content with compelling calls-to-action within the text to get your visitors to the solution that is best for them. Focus your content on the customer and tell them how you can help them. You can write about your company on the about us page. 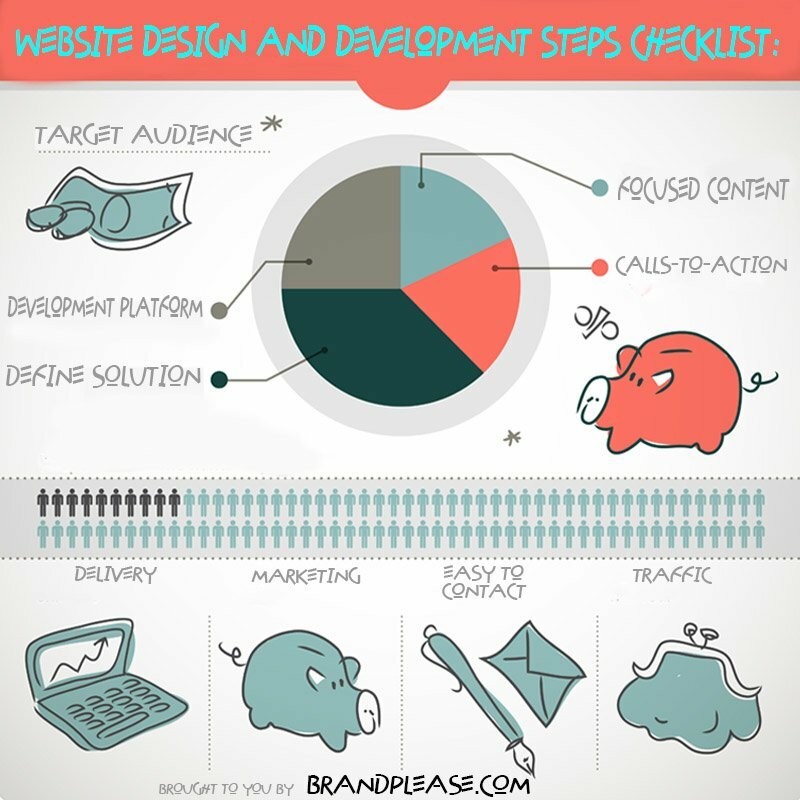 That is just a generic outline for creating your own website design and development steps checklist. Some of the items on that list may not apply to you. But it is a good checklist to use during the planning phase.